KSC Kreate, a full-service creative firm that blends art with science to produce beautiful, dynamic imagery for consumer products manufacturers and retail brands, announces today a rebrand project with Sam’s Club, a division of Wal-Mart Stores. KSC Kreate is shooting select food items for Sam’s Club Member’s Mark packaging, now known as the Artisan Fresh and Daily Chef brands. KSC Kreate was selected by Sam’s Club for this project based on their ongoing partnership and previous award winning work for the brand, as well as KSC Kreate’s experience in the food packaging space. KSC Kreate’s previous photography and packaging work for Sam’s Club won five awards at the Private Label Trade Show in Chicago last December including the “Best in Show” Award. The project takes place at KSC Kreate’s 55,000 square foot studio in South Florida. The expert team of food stylists, art directors and photographers are using signature special effects such as their heating and steaming tools to achieve the ideal photograph for the brand. Through their unique tools and expertise, KSC Kreate’s photographers capture the product’s essence and increase the appeal to consumers who make purchase decisions based on packaging. Sam’s Club is also using KSC’s proprietary tool, TIME Director, KSC Kreate’s remote art direction application, for the photo shoot. KSC Kreate clients can log into TIME Director to view the shoot and make immediate approvals or changes to any photograph, expediting the process and maintaining a high level of consistency and quality across the multiple project teams. KSC Kreate’s portfolio of food photography and packaging projects includes major brands such as Coca Cola, Pepsi, Winn-Dixie, Wal-Mart, Mr. Coffee, Food Saver, World Table, Oster, Great Value and Sunbeam. The company has also worked with restaurant chains like Burger King, Miami Subs, McDonald’s and Lime to produce and create food photography for websites, menus, in-store signage and billboards. 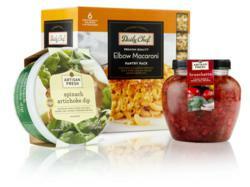 Consumers can expect to see the new packaging on Sam’s Club shelves beginning in March 2012. Sam’s Club, a division of Wal-Mart Stores, Inc. is the nation’s eighth largest retailer and a leading Membership warehouse club offering superior products and services to more than 47 million Members in clubs across the U.S., as well as in Brazil, China and Mexico. Members save an average of 30 percent over traditional retailers. To learn more about Savings Made Simple®, visit SamsClub.com, and look for Sam’s Club on Twitter and Facebook.